Indy bound: NBC5's Todd D. Wallace goes smaller to get bigger job. Todd D. Wallace, who's been anchoring NBC5's weekend Today program, will be joining ABC station WRTV-TV in Indianapolis to be part of a new featured anchor team. 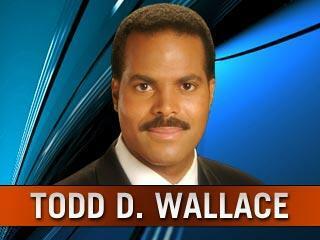 Wallace arrived at NBC5 in June 2003 after starting his TV career in 1992 at a Jackson, Miss. TV station. In leaving D-FW, he's downsizing from the No. 6 (soon to be No. 5) market to No. 25. But he'll be much more visible in Indy with new anchoring partner Trisha Shepherd from WHO-TV in Des Moines. They'll start in September as replacements for incumbent anchors Ray Cortopassi and Martha Weaver, who didn't make the ratings meter tingle. Riotous station general manager Don Lundy already is calling his new team "T'nT" on his official blog. We'll have some ratings notes shortly, but first this. Thankfully, everyone's OK after engine failure forced the crew of Fox4's Chopper 4 to make an emergency landing Monday morning in Grand Prairie. 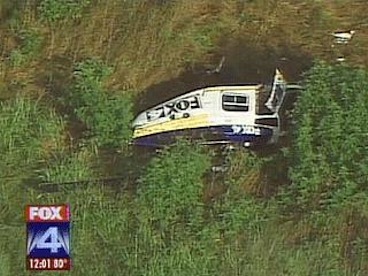 Pilot Curtis Crump, Fox4 reporter Chip Waggoner and KRLD traffic reporter Julie DeHarty all escaped serious injury, the station reports. The crash occurred shortly after the weekend Nielsen ratings printouts reinforced the summertime pulling power of Fox4's 9 p..m. local newscasts. Sunday's edition tied CBS' 60 Minutes as D-FW's most-watched program of the entire day, with each averaging 168,980 homes. The measurement includes all audience groups, from teens to elders. The 9 p.m. newscast also topped all prime-time shows (6 to 10 p.m.) among advertiser-courted 18-to-49-year-olds and 25-to-54-year-olds. Sunday likewise brought good news for NBC5's 10 p.m. newscast. It exceeded Fox4's prime-time performance in both the 18-49 and 25-54 demo to rank as the day's most-watched program in those key audience measurements. Friday and Saturday brought more dismal performances for network entertainment programming. So let's get to Friday's local news derby, where Belo8 notched 10 p.m. wins in both total homes and with 25-to-54-year-olds, the main advertiser target audience for news programming. Fox4 again dominated at 6 a.m. with twin wins. And the 7 to 9 a.m. portion of its Good Day also comfortably outpointed the three network morning shows. Belo8 won at 5 p.m. in both ratings measurements, and also placed first in total homes at 6 p.m. NBC5 had the most 25-to-54-year-olds at 6 p.m.
Belo8 weatherman Troy Dungan took the cake Wednesday, both in the shape of his trademark bow tie and in the D-FW Nielsens. Dungan's 6 p.m. newscast farewell drew 195,160 homes, making it the day's most-watched program in total homes. That's a nice and fitting sendoff to a classy guy who will still pop in at Belo8 on occasion. Later Wednesday, a second episode of Fox's Don't Forget the Lyrics! had prime-time's biggest haul among advertiser-craved 18-to-49-year-olds. Its numbers aren't up to those of NBC's The Singing Bee, but they're still good enough to keep Fox humming. The 10 p.m. local newscast wars went to NBC5 in both total homes and with 25-to-54-year-olds, the main advertiser target audience for news programming. Fox4 again won twice at 6 a.m. and Belo8 ran the table at 5 and 6 p.m.
Also of note: Katie Couric's CBS Evening News had an uncommon second place finish at 5:30 p.m., beating the NBC Nightly News in total homes. 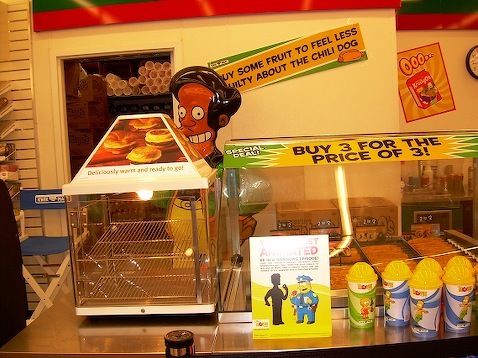 Marketing genius can be D'Oh so easy when you have The Simpsons on your side. 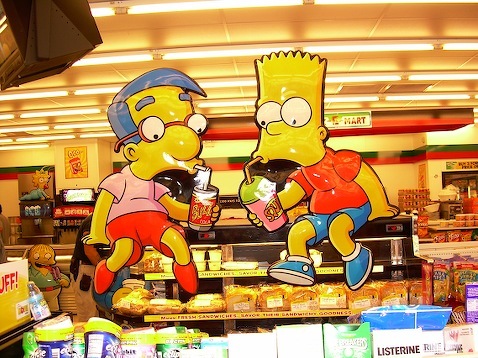 Case in point: the Dallas 7-Eleven anointed as one of the chosen few in what's going to be a full-metal marketing campaign for the July 27th opening of The Simpsons Movie. As of Monday, the 6833 Northwest Highway at Hillcrest location has been a very Simpsons-esque Kwik-E-Mart. It'll stay that way through July 31 as one of just 11 U.S. sites to be seen. Tuesday morning brought another onrush of tourist/customers, who snapped pictures and snapped up commemorative boxes of Frosted Krusty O's at $3.99 apiece. They not g-r-r-r-reat. But they're "The Best You Can Expect From A TV Clown." There also are limited quantities of Buzz cola and Radioactive Man comic books, but no Duff beer. Simpsons characters and signage are resplendent throughout, but be forewarned that "This is not a library." It is, however, a hot spot, with parking spaces in short supply on this late Tuesday morning. 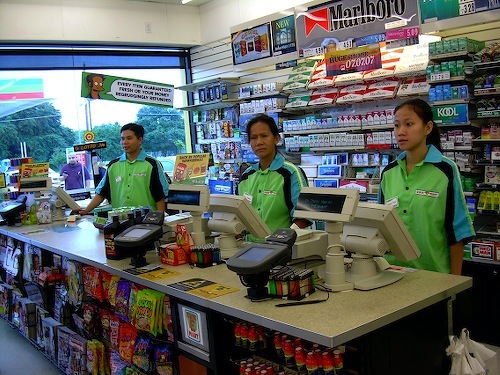 The overall mood is bracingly jovial, whether it's the friendly greeters offering to take your picture or the grinning customers streaming through. This place is a ray of sunshine amid the incessant gloom afflicting the great outdoors. Let a smile be your umbrella as you check out the First Bank of Springfield advertisement at the entrance. "Misplacing Decimal Points Since 194.5," it says. Here's the overall point. Whatever your latter day take on The Simpsons, this is a very fun spot to be. So tell 'em Uncle Barky sent ya. And here's one last picture for the road.